Temple of Athena Polias and Zeus Polieus on the northern edge of the Acropolis. It is orientated E-W and was a poros Doric peripteral temple (having a columned portico on all four sides). 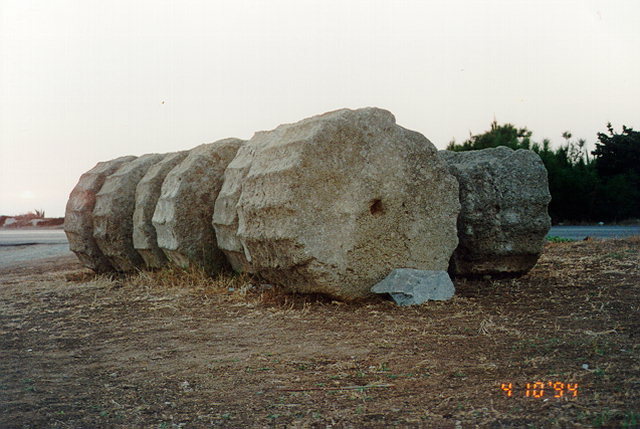 Four oversize column drums and parts of a capital and architrave still to be seen on the site are an indication of its original monumental character. This was where the Rhodians kept the texts of their treaties with other states. The temple stood in a larger temenos bounded by a stoa on the east.